Doodlecraft: Doctor Who Painted TARDIS Heels! 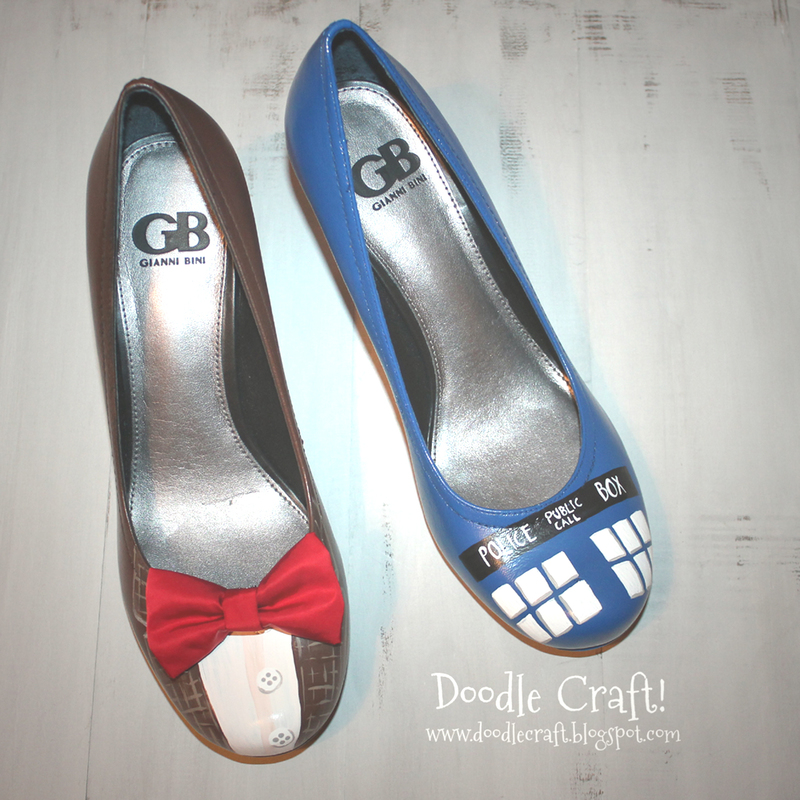 Doctor Who Painted TARDIS Heels! Make a statement on your feet! Best shoes in all of time and space! I have wanted Doctor Who shoes for so long. I am sure you'll want them as well! the other complete with bowtie! I found some plain jane shoes at the thrift store. I went high end on this...ha ha, actually they did end up costing almost 10 bucks! Well, whatever...they were perfect for what I envisioned. You might have the perfect pair of shoes in your closet right now! so you'll need shoes...any shoes should work. And a little fun on the heels. Prep the shoes for painting! filled them with plastic bags and then taped across the top. paint the bottoms...and it gives it that professional "store bought" look. I took them out to the garage and spray painted them. Very light coats. I didn't want drips or cracking. I did about 3 light coats and that gave me perfect coverage. the spray paint gives them a nice, even finish...perfect! 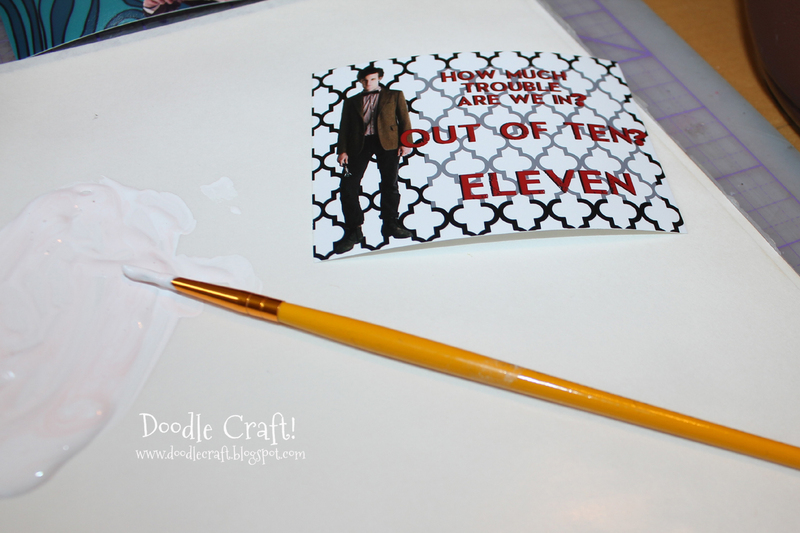 Allow the paint to dry to the touch and remove the tape and plastic. Then let them dry/cure for about 48 hours. Now comes the fun of painting. sketchy rendition...so I free handed it. but I nicked it too...you can see where the paint wore off...so be careful! I painted right across the stitching with no problems. I was watching "Blink" during this...The Angels have the Phone box! freehand painted right on the black strip. I used one of my Valentines to freehand the suit. I mixed my paint on some wax paper. Added the jacket lapels and sort of a sketchy tweed sports jacket look. As well as some buttons in white...with some gray shadows. And some fun on the heels. Now, take those to your spray painting landing pad and clear coat them. This will keep them in pristine shape. Allow them to cure again about 48 hours. They are cool and really complete the look of the suit shoe. So, you'll need 1 shoe clip. Looks like I'll be making more shoe clips soon! So, I just threw these together using some red silky scrap I had. Fold it over like a tube and hot glue it together. And fold both the edges over onto it. Scrunch up the center...and hot glue it in place. front and glue it on the backside. tacked it on with needle and thread. I went ahead and made 2. They are shoe clips after all and are removable and usable on other shoes! The bow just clips on the edge of the shoe, not harming the paint! See, the COOLEST shoes ever! 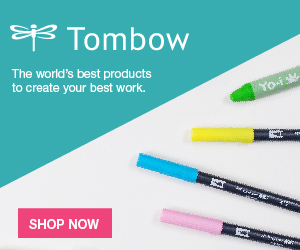 Are you inspired to make your own? So nice and creative!! !..but I'm a duffer to paint ! Love them! I'm not talented enough to do that, but I want some. So cute!!!! Thank you for sharing how to make them. I really want to do this project. In the process of making these! Just spray painted and they are looking so good! Also, mine are flats instead of heels but they are still looking sooo cute! Don't you just want to make these and sell them in your Etsy store? I would love to buy them, but I am not talented enough to make them! I must quote @Gina... have ever think to sell on Etsy? I would be interested in purchasing a pair as well. I want a pair! So not crafty though!! Can I pay you to make me a pair?? Even though I'm a guy I really want a pair. ZOMG, excellent! Have you had problems with the paint flaking? I've used vinyl spray dye instead of regular spray paint to dye shoes. It doesn't come off. that's soo cool and unique experiment with high heel shoes...!! so cool art work on pumps shoes ...loved the blog !! hi! Love does shoes. Did you use regular spray paint or some special one? YES! I am doing this! What brand & color of spray paint did you use for the TARDIS? It looks perfect! 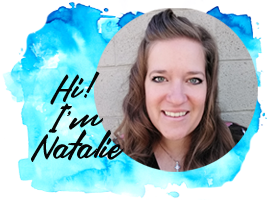 I can not get over how awesome your heels are, Natalie!! So glad to have stumbled upon them via Pinterest! Guess WHO I featured on my blog today? You! ;) -> http://bit.ly/17TmHhQ ... Thanks so much for sharing your creativity and the wonderful tutorial!! Hi - I saw your shoes and loved them so much I did my own. I wore them to a film festival and EVERYONE loved them! They are my new fav shoes for sure!! BUT my paint is chipping!! I did a clear protective coat and even that is splitting, mainly where the toe bends when I walk. Any ideas on how to stop that from happening? I'm going to re-spray those areas, unless of course you have a better idea! What an awesome tutorial. 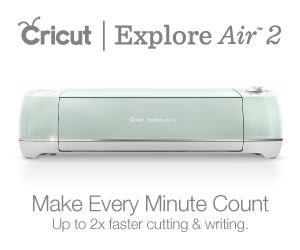 I've saved it straight to my DIY Bucketlist. 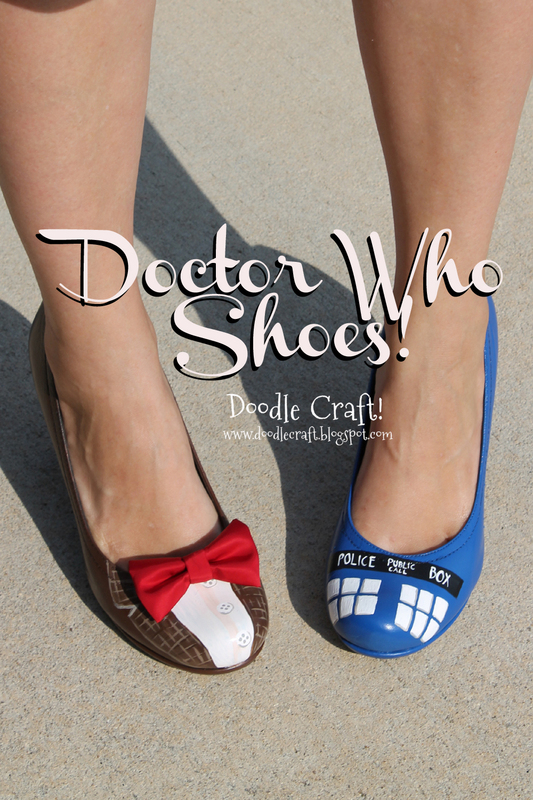 I want to make myself a pair Doctor Who shoes too. Thank you so much for sharing this! Thank you so much for the step by step! My friend was looking for a birthday gift for his wife and I made these for him.. I am so going to make these for my daughter! So cute!